Marian University and the Unleavened Bread Cafe are excited to announce that authors of The Unleavened Bread Cafe: Twenty Years of Living Water will read their published poems. Tuesday, April 4th, at 6:30 p.m. This reading is free to attend and requires no RSVP. The Unleavened Bread Cafe: Twenty Years of Living Water is a collection of writing in celebration of the cafe’s 20th anniversary. It includes creative pieces written by women who have overcome substance abuse, domestic violence, and other injustices and trauma. The women created the poems and memoirs in a writing workshop held at the Unleavened Bread Cafe and facilitated by Assistant Professor of English, Wendy Vergoz, and student writing interns from Marian University. The book also includes a history of the cafe and a biography of its founder, Elease Womack, both written by student interns. Finally, the book contains a compilation of remembrances written by people whose lives have been touched by the cafe’s presence in the Mapleton-Fall Creek Community. Copies of The Unleavened Bread Cafe: Twenty Years of Living Water will be available for purchase for $20 by cash or check with all proceeds benefitting the cafe. 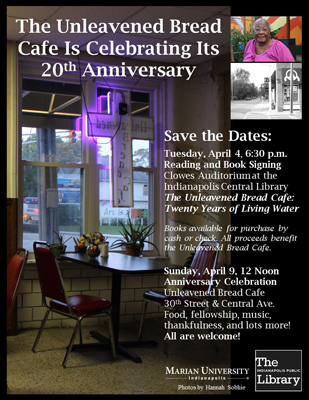 The cafe’s Anniversary Celebration will continue on Sunday, April 9th, from noon-3 p.m. at the Unleavened Bread Cafe, 3003 North Central Avenue, Indianapolis, IN 46205. The Sunday celebration will feature a video tribute to the cafe created by Vergoz and her interns with help from Marian University’s videographer, Peter Matsoukas. Discover early military aviation during World War I with Ruth Ann Ingraham, author of “Cap” Cornish, Indiana Pilot: Navigating the Century of Flight. On the anniversary of U.S. involvement during World War I, learn more about Ingraham’s father Colonel “Cap” Cornish and his role as a fighter pilot and in Indiana aviation. Investigative reporter and former Indianapolis attorney Mark Shaw will be signing and discussing his new book, The Reporter Who Knew Too Much: The Mysterious Death of "What's My Line" TV Star and Media Icon Dorothy Kilgallen. Jennifer Hurley will reach from her new chapbook, "Origin". 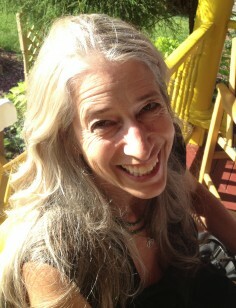 Tracy Mishkin will also be reading from her book "The Night I Quit Flossing." A winner of many international literary awards, including the prestigious Booker Prize, Arthur C. Clarke Award, Governor General’s Award, the PEN Pinter Prize, and a Guggenheim Fellowship, Margaret Atwood is the author of more than forty volumes of poetry, children’s literature, fiction, and non-fiction. She is perhaps best known for her novels, which include The Edible Woman, The Handmaid’s Tale, The Robber Bride, Alias Grace, The Blind Assassin, Oryx and Crake, and The Year of the Flood. Her non-fiction book Payback: Debt and the Shadow Side of Wealth, part of the Massey Lecture series, was made into a documentary. Her recent novel, Madaddam (the third novel in the Oryx and Crake trilogy), has received rave reviews: “An extraordinary achievement” (The Independent); “A fitting and joyous conclusion” (The New York Times). The trilogy is being adapted into an HBO TV series by celebrated filmmaker Darren Aronofsky. Atwood’s most recent collection of short stories is Stone Mattress. Her most recent novel is called Hag-Seed, and it is a modern retelling of Shakespeare's The Tempest. In addition, Atwood has authored a graphic novel: volume one of Angel Catbird appeared in 2016 and the second volume will be released soon. In March 2017, Atwood will be the honored recipient of the Ivan Sandrof Lifetime Achievement Award, presented by the National Book Critics Circle. Atwood’s work has been published in more than 40 languages, including Farsi, Japanese, Turkish, Finnish, Korean, Icelandic and Estonian. In 2004, she co-invented the LongPen, a remote signing device that allows someone to write in ink anywhere in the world via tablet PC and the internet. She is a founder of the Writers’ Trust of Canada and a founding trustee of the Griffin Poetry Prize. She is also a popular personality on Twitter, with over a million followers. Dana Roeser is the author of three books of poetry: The Theme of Tonight’s Party Has Been Changed, winner of the Juniper Prize (University of Massachusetts Press, 2014), and In the Truth Room (2008) and Beautiful Motion (2004), both winners of the Samuel French Morse Prize (Northeastern University Press/University Press of New England). She has been the recipient of an NEA fellowship, the Great Lakes Colleges Association New Writers Award, and the Jenny McKean Moore Writer-in-Washington Fellowship. Her poems have appeared in The Iowa Review, Harvard Review, Denver Quarterly, Michigan Quarterly Review, Antioch Review, Alaska Quarterly Review, Laurel Review, Virginia Quarterly Review, Massachusetts Review, Prairie Schooner, Southern Review, Northwest Review, POOL, Shenandoah, Sou’wester, and other journals, as well as on Poetry Daily and Verse Daily. Roeser has received fellowships for residencies at Yaddo, Ragdale, the Virginia Center for the Creative Arts, Le Moulin à Nef (VCCA France), St. James Cavalier Centre for Creativity (Valletta, Malta) (VCCA International Exchange), and Mary Anderson Center for the Arts. Donald Platt is the author of Tornadoesque (2016), Dirt Angels (New Issues Press, 2009), My Father Says Grace (Arkansas University Press, 2007), Cloud Atlas (Purdue University Press, 2002), and Fresh Peaches, Fireworks, & Guns (Purdue University Press, 1994). His honors include the Discovery/The Nation Poetry Prize, the Paumanok Poetry Prize, two Verna Emery Poetry Prizes, and two fellowships from the National Endowment for the Arts. He teaches at Purdue University and lives in West Lafayette, Indiana. 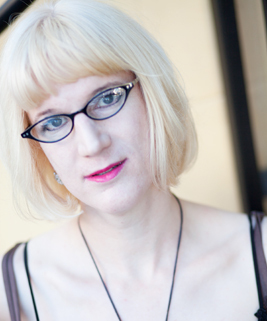 Charlie Jane Anders is the author of All the Birds in the Sky and Choir Boys, which won the Lambda Literary Award. She’s the organizer of the Writers With Drinks reading series, and she was a founding editor of io9, a website about science fiction, science, and futurism. Her stories have appeared in Asimov’s Science Fiction, The Magazine of Fantasy & Science Fiction, Tor.com, Lightspeed, Tin House, ZYZZYVA, and several anthologies. Her novelette “Six Months, Three Days” won a Hugo award. April 8, 2017, at 7 p.m. 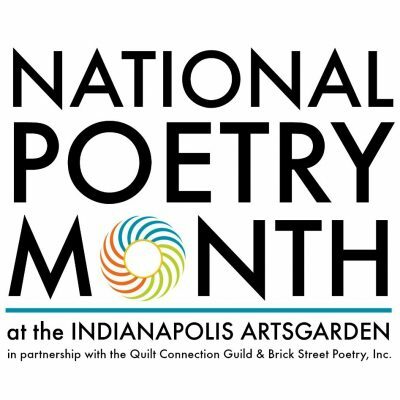 In partnership with Brick Street Poetry, Inc. and the Quilt Connection Guild, the Indianapolis Artsgarden presents weekly poetry readings from Indiana poets each Monday at 12:15 pm in April in celebration of National Poetry Month. $5 cover (can be added to your tab). Marilyn Chin is a poet, translator, novelist, and a professor at San Diego State University. She is author of Hard Love Province, which won the Anisfield-Wolf Award in 2015. She is also author of Revenge of the Mooncake Vixen, Rhapsody in Plain Yellow, The Phoenix Gone, The Terrace Empty, and Dwarf Bamboo. Event is free, no tickets required. Seating available on a first-come, first-served basis. These three embody what is pure and true about using words to capture a audience. This year we have FIVE new authors all with new book releases—three of them are New York Times bestselling authors, and two are debut novelists. 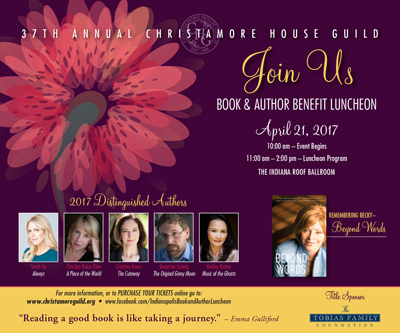 Full list of 2017 authors: Christina Baker Kline, A PIECE OF THE WORLD (best know for her bestselling ORPHAN TRAIN); Sara Jio, ALWAYS; Christina Kovac, THE CUTAWAY; Benjamin Ludwig, GINNY MOON; Vaddey Ratner, MUSIC OF THE GHOSTS. Come celebrate National Poetry Month & the Indianapolis release of Nancy Chen Long's 'Light into Bodies,' winner of the 2016 Tampa Review Prize for Poetry. Long will be joined by poets Rachel Sahaidachny and J.T. Whitehead. Rachel Sahaidachny holds an M.F.A. in Creative Writing from Butler University. She was a finalist in the 2016 Radar Poetry Coniston Prize, awarded first prize in the Wabash Watershed Indiana Poetry Awards, and twice nominated for the AWP Intro Journals Award. She is co-editor of Not Like the Rest of Us: An Anthology of Contemporary Indiana Writers, and former poetry editor of Booth: A Journal. Recent writing has been published in Southeast Review, Radar Poetry, Written Here: The Community of Writers Poetry Review, Red Paint Hill, Nuvo, Indiana Humanities, and others. She works as programs manager for the Indiana Writers Center in Indianapolis. J.T.Whitehead has traveled in Holland, France, Hong Kong, and China, and has studied in the U.K. Whitehead's work has appeared in Left Curve, the Lilliput Review, and Gargoyle. He is a Pushcart Prize-nominated short story author, a Pushcart Prize-nominated poet, and the winner of the 2015 Margaret Randall Poetry Prize. 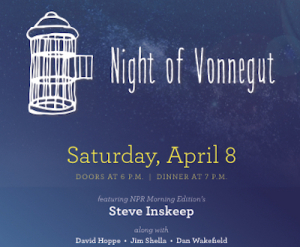 He is also the Editor in Chief of So It Goes: The Literary Journal of the Kurt Vonnegut Memorial Library. His collection of poetry The Table of the Elements (Broadkill River Press 2015) was nominated for the National Book Award. He lives in Indianapolis with his wife and two sons, where he practices law by day, and writes poetry by night. Free open mic poetry every Thursday 7-9 pm on the deck of Irving Theatre.